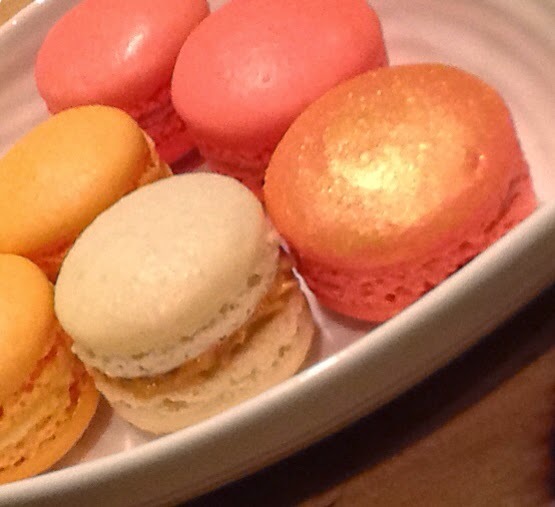 Generally I've been quite satisfied with the results of my macaron experiments. A few weeks ago I worked my way through the splendid "Mad About Macarons" book and I turned into a feeder both at home and in the office, pressing macarons on anyone within the same postcode as me. My book said bake at 160 fan for 8-12 minutes. But this gave me a problem with browning which spoiled the aesthetics (though not taste) of the smooth shell surface. Having got most of the rest of the techniques right, I really wanted to crack this one. 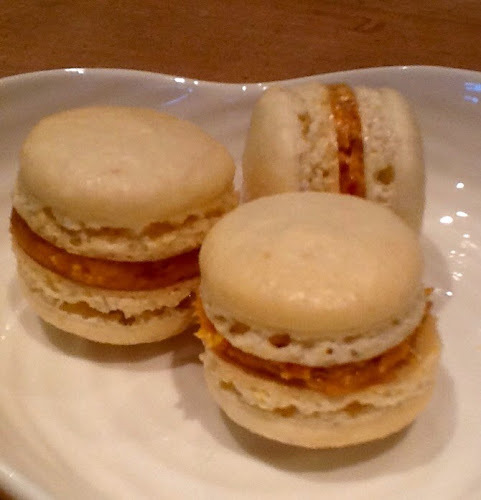 And I was keen to stop making the ugly monster macarons of earlier blogs. I had already switched to powdered food colourings, having read that liquids and some gels are not heat resistant and decided to conduct scientific experiments with temperatures and timings. I started by checking my oven temperature by sticking my sugar thermometer on shelves at the top, middle, bottom and sides of the oven starting at 140 degrees (fan). 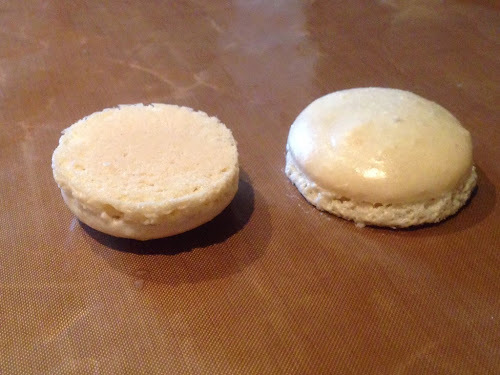 It was giving a reliable temperature throughout so the next test was to prepare a batch of macaron batter and be willing to sacrifice it in experimentation. 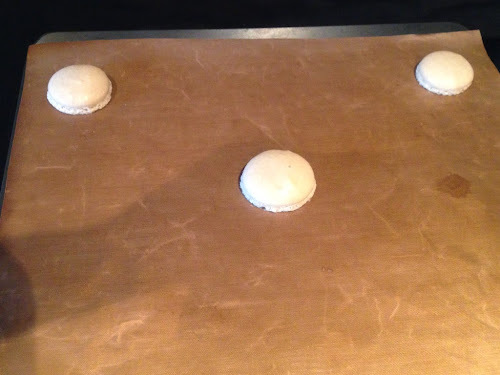 I drew up a list of temperatures, each with a range of times beside it and piped 5 macaron blobs onto my baking sheet, 4 in each corner and 1 in the middle to make sure I was checking all extremes of my oven. Starting at 140 for 18 minutes, I baked and crossed my fingers and got not one but two nice surprises. You are advised to rest the batter for 30 mins to allow the top of the shells to dry out before placing in the oven. This is important in forming the little ruffled foot at the base of the shell. Because I was testing for browning I didn't bother with this step and popped the piped shells straight into the oven and look what came out....Lovely little ruffles and no browning in sight. Great! I decided not to rest any of them and had no issues with feet not foarming, they all came out beautifully. This will be a real time saver in future! See the goldy shines one below? It's some food glitter powder which I applied using my finger. One of the useful things about making plain white shells is that they are neutral in flavour terms so you can fill them with any coloured filling and not worry about having a mismatch of shell colour and flavour. Below is salted caramel. 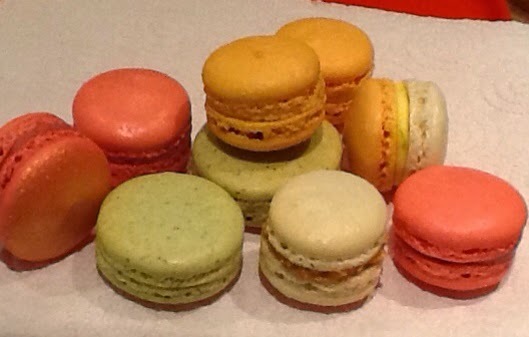 These were simply gorgeous and I had to freeze them immediately or risk eating the whole lot. 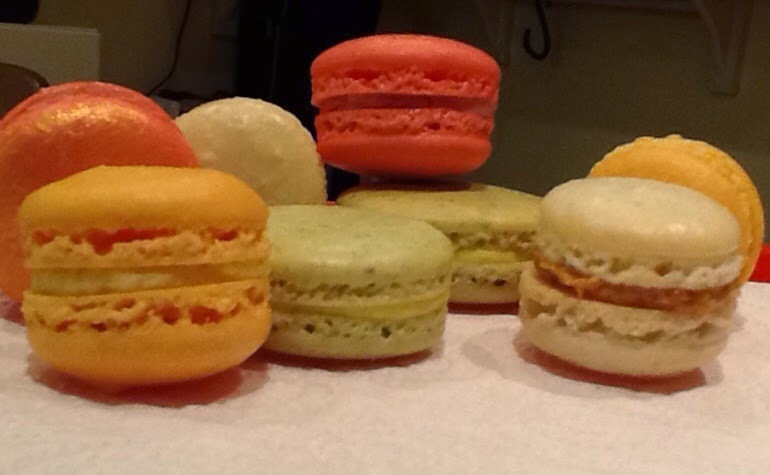 I love that about macarons, you can freeze them and defrost as needed. Make sure you defrost them inside a bag or a sealed box. If the air gets to them as they defrost the shells go mushy. Keep them covered and they come out crisp and just as good as when you put them in the freezer.